view another article... This foot condition is the new back pain — it’s everywhereCarestream, CurveBeam to spread word about weight-bearing CTNew Cartiva ImplantUFAI featured on ABC NewsCarolina Panthers Star Lotulelei's Foot InjuryFoot Surgery InnovationsBiggest Opportunities for Foot SurgeonsDoctors TV Show - Foot Surgery while Pregnant10 Diseases Your Feet Can Reveal, Readers DigestPlantar Fasciitis TreatmentsThe Doctors TV, Living with Plantar FaciatiisHow to Stop Foot Pain for Good44 Ways to Correct Hallux ValgusDo fat-soled running shoes protect aging joints?Ankle replacement can restore mobilityCam Newton's Ankle InjuryMinimally invasive Foot & Ankle Surgery49ers' Crabtree 'amazing' Achilles recoveryAbout Kobe Bryant's Knee InjuryCurry more likely to play than Bryant3-D Scan Reveals Foot Damage by High HeelsAlbert Pujols' Foot InjuryWill Kobe Return? Doctors Raise Questions About Laker Star's Future In The NBAWhat Kobe must do to prove 'doubters' wrongKobe Bryant's difficult task ahead after injuryPau Gasol's return from foot injuryIs barefoot running a bad fad, or better choice?Born to Run Barefoot?Born to run barefoot? Some end up getting injuredCan a $15 basketball shoe have game? While the pain often manifests itself in the heel, the problem is rooted in the lower leg. Dealing with plantar fasciitis is a big pain in the foot, but sufferers can alleviate much of the suffering through stretching and massage. If you have heel pain when you get out of bed every morning, it could be plantar fasciitis. According to the American Academy of Orthopeadic Surgery, the condition affects about two million people per year. While it often can be successfully treated at home, it’s important to respond at the first signs of pain. Benjamin Cullen, a podiatrist affiliated with Sharp Memorial Hospital in San Diego, Calif., says although the condition is more common in middle-aged people, it can happen “to anyone at any age.” Plantar fasciitis can affect everyone from sedentary, overweight people to athletes. Cullen says people with flat feet or hereditary foot structure problems can be more susceptible to developing the condition. While the pain often manifests itself in the heel, the problem is rooted in the lower leg, says Bob Baravarian, a board certified podiatric foot and ankle specialist at Providence Saint John’s Health Center in Santa Monica, Calif. Baravarian says in many cases, a tight calf muscle or Achilles tendon can result in “pronation” and a collapse of the arch of the foot. This pulls on and inflames the plantar fascia, a thick band of tissue that runs on the bottom of the foot between the heel bone and the toes. Pain from plantar fasciitis typically is worse in the morning and decreases as the person walks around and it becomes more limber. The condition usually is diagnosed by physical examination. In many cases, x-rays can reveal heel spurs, which are calcium build-ups on the heel bone that are caused by strains on foot muscles and ligaments. Baravarian says most people can remain active in the early stages of plantar fasciitis. Patients should start by ensuring they’re wearing supportive shoes and may consider a small heel lift to decrease the pull of the Achilles. There are a number of inserts on the market specifically designed for plantar fasciitis as well as custom orthotics, which can be molded and conformed to the exact shape and size of the foot. Baravarian says most people can manage their plantar fasciitis if they take steps early on to reduce inflammation and continued agitation of the plantar fascia. “As it becomes chronic, it becomes harder to stay active because it won’t go away after some minutes in the morning,” he says. Dr. Ken Jung, a foot and ankle surgeon at Kerlan-Jobe Orthopaedic Clinic in Los Angeles, says it’s worth considering a variety of treatments “since there is no one-size-fits-all solution for plantar fasciitis.” Doctors also can prescribe anti-inflammatory medications, steroid shots and even extracorporeal shock wave therapy. Few patients need surgery, but it is a last resort when all other options have been exhausted. Jung says that while plantar fasciitis can be resolved 90 percent of the time, he still instructs patients to maintain a regimen of stretching to maintain flexibility. 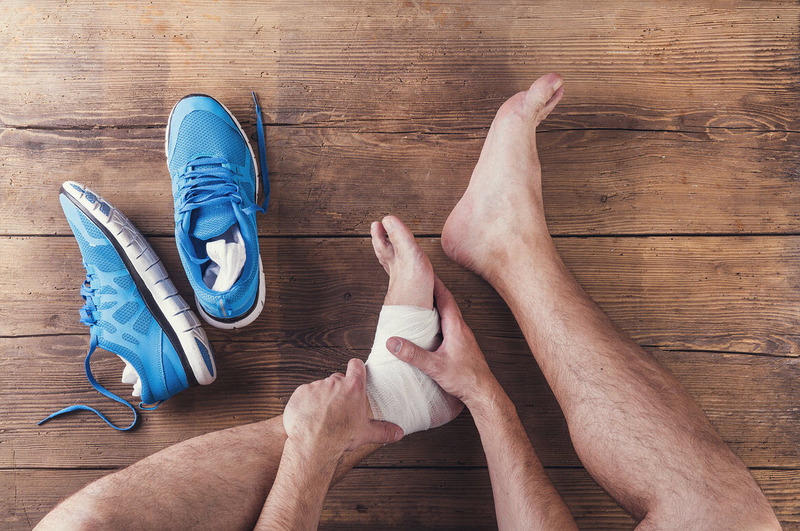 Once pain subsides and the plantar fasciitis is resolved, patients still could be susceptible to the condition if they do not continue to stretch and manage their plantar fascia. Effective exercises include calf raises, straight leg calf stretch, calf rolls with a foam roller and moderate foot stretching. Jung says regularly massaging the heel with an ice bottle and ball also can help maintain flexibility. “It may take a combination of therapies, but I can’t emphasize enough how important stretching is. Symptoms may recur if the tissues become tight,” Jung says.